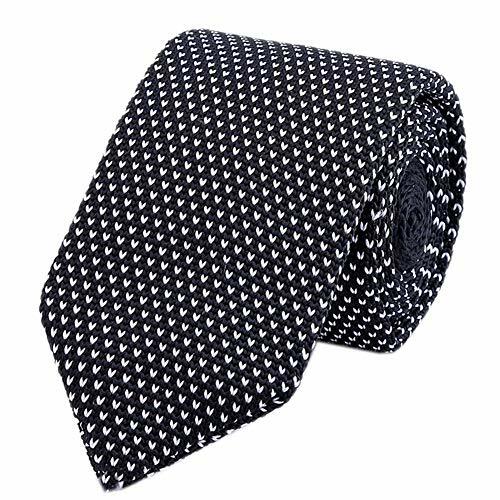 Business Fashion Skinny Formal wedding party Stripe/ Polka dot/ r Patterned Knit necktie, Length: 148cm(58"), widest: 6cm(2.75"), Suitable for men and big boy. Material: care-free from fine wool cotton and silk-blend, Dry cleaning, low temperature ironing. PLEASE NOTE: This tie has a standard pointed bottom and not the flat bottom. Infuse a classic confidence into your style this season with this beautifully designed knit skinny tie in a versatile shade of jet black with white V patterned. This heritage design has an inherent sense of style and prestige that belongs in every man's accessory rotation. The handsome knit design has a casual aesthetic that pairs with absolutely everything. We love to see this designer necktie teamed up with a black and white gingham dress shirt, jeans and a black wool blazer. The pointed off tip and thin design of the tie and the creative texture make this tie a casual piece that pairs exceptionally well with cardigans, blazers and patterned button downs.